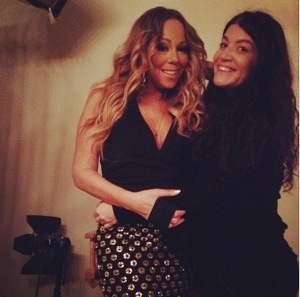 Mariah Carey posted a pic of her and her hairstylist before her Black Girls Rock pink carpet entrance on Oct 6. Future put a Ring on It! “Chiefin with a Chief,” she posted. Who’s at Dinner With Teyana Taylor? Khloe Kardashian and Kendall Jenner in Their Halloween Masks? 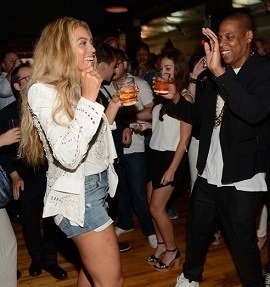 Jigga, Bey and a host of family and friends toasted to the release of the rappers new highly anticipated album <Magna Carta Holy Grail on July 3. Beyonce flew in to Brooklyn after her show in San Jose the night before. Jay-Z’s sisters Andrea and Michelle Carter and nephew Jarrell Carter attended, as well as Timbaland and Nick Cannon. Katy Perry posted this picture of her hugged up with boyfriend John Mayer backstage at his concert in Philadelphia on July 4. Paris Hilton and friend Amaury Nolasco celebrated Independence Day in Malibu. After weeks of circulating rumors, Mariah Carey is the next judge to announce she will not be returning to Anerican Idol next season. To catch Mariah on television, be sure to watch her perform on Macy’s Fourth of July Fireworks Spectacular on NBC, Thursday July 4 at 8p ET. AI alum Jennifer Hudson has signed on to take Randy Jackson’s place as an American Idol judge for season 14. Hudson came in third during her losing season, where the winner was Fantasia Barrino. None of the other judges Nicki Minaj, Mariah Carey or Keith Urban will be returning either. Therefore, other alum are bring considered to fill a judging seat, including Kelly Clarkson, Clay Aiken and Adam Lambert. While spotted at the opening of Hakkasan Las Vegas Restaurant and Nightclub at MGM Grand in Vegas, Jennifer Lopez neither confirmed or denied replacing Mariah Carey on American Idol. “Um, you know, I don’t have much to say about that right now,” she said. next season, Jennifer simply doesn’t know yet. Ok J-Lo, we’ll leave you alone about it for now. Mariah to be Replaced With J-Lo Before the Season is Over?!! Every morning talk show was talking about American Idol this morning! The big, huge rumor and elephant in the room for one Idol judge is AI judges underhandedly have a plot to replace Mariah Carey with Jennifer Lopez mid-season! A source says that AI execs were definitely thinking about it, but had to back off when Mariah threatened to sue! It seems pretty obvious that Mariah isn’t a good fit for the show. Hopefully, she’ll quit before they fire her. We still luv you Mariah, girl!